The HTML5 Medical Viewer demo is an example of extending a PACS over the web. It allows any Web browser to query, retrieve and view DICOM images from anywhere over the Web with zero foot-print deployment. The HTML5 viewer demo uses the Web server's WCF REST service to query and retrieve image information, manage the client patient record access and move DICOM instances from other remote PACS. The viewer utilizes the WCF REST service by streaming a JPEG compressed version of the DICOM image for fast display, then it streams the original DICOM image as raw data in the background to allow accurate Window leveling processing. The viewer portion of the HTML5 Web Viewer demo implements many tools commonly used by the physicians such as window-leveling, interactive Pan and Zoom, series scrolling, annotations, overlay tags and magnifying glass. The demo utilizes the built-in browser cache for images by initiating GET requests supported by any browser. Since a requests contains an encrypted user token, it will make sure that other clients will not have access to the cached images since each client will have their own token. The HTML5 Medical Viewer demo also implements user management, permissions and patient access rights; allowing administrators to control who can access what from anywhere over the web. For example, an administrator can create a new user account, assign only query and view images permissions for the local archive and limit user permissions so the user can access only those patient information and images that the user has been given permission to access. A technician can also benefit from the framework by requesting the download (C-MOVE) of images/series from other remote PACS into the local PACS and add that into a queue so DICOM series are ready to be viewed by the physician when needed. Administrators can make sure that technicians can perform this operation without compromising the security of patient information by limiting the access of the technicians to querying the local archive or viewing the images. 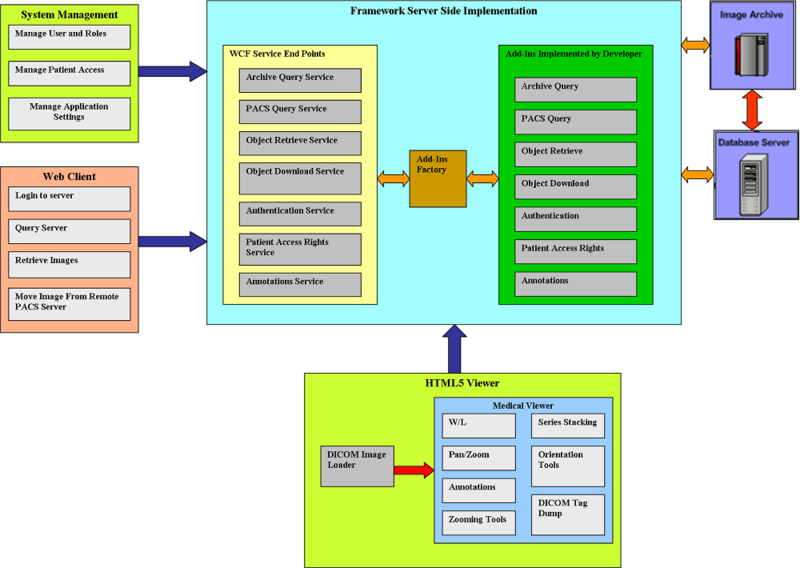 The following system architecture diagram details the components of the HTML5 Viewer, HTML Client and the System Management system, as well as the workflow relationships among the Server Side of the LEADTOOLS HTML5 Web Viewer Framework, Image Archive and Database Server.